Description: A fine tooth ratchet and socket system that changes from a pass-thru system to a conventional ratchet handle with included adapter that allow for the use of standard sockets. Pass-thru sockets work when even deep sockets are too short. 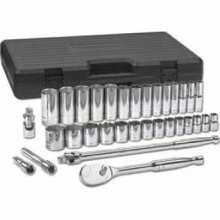 Lifetime Warranty Set Includes: Gear Ratchet handle, seven Fractional pass-thru sockets (3/8"-3/4"), ten Metric pass-thru sockets (10mm-1..
33 Pc. SAE 6Pt. Standard & Deep Socket Set 1/2" DRIVE 80715 Item No. Description 80678 1-1/4" 6 Pt. Std. SAE Socket 1/2" Dr. 80679 1-1/2" 6 Pt. Std. SAE Socket 1/2" Dr. 80684 7/16" 6 Pt. Deep SAE Socket 1/2" Dr. 80614 1/2" 6 Pt. Deep SAE Socket 1/2" Dr. 80615 9/16" 6 Pt. Deep SAE Socket 1/2" Dr. 80616 5/8".. Features and Benefits Patented bit holding system forces bit surface to opposing side for maximum retention Chrome sockets; heat treated for durability and service ability S2 and Alloy steel bits Packaged in patented impact resistant "Slide Rail" System for ease in socket storage 10 Piece 3/8" and 1/2" Drive SAE Hex Bit Set includes: 5/32", 3/16", 7/32", 1/4", 5/16", 3/8", 7/16", 1/..